Forget the old conventional wisdom that most page posts on Facebook contain images and think links, at least in terms of volume. 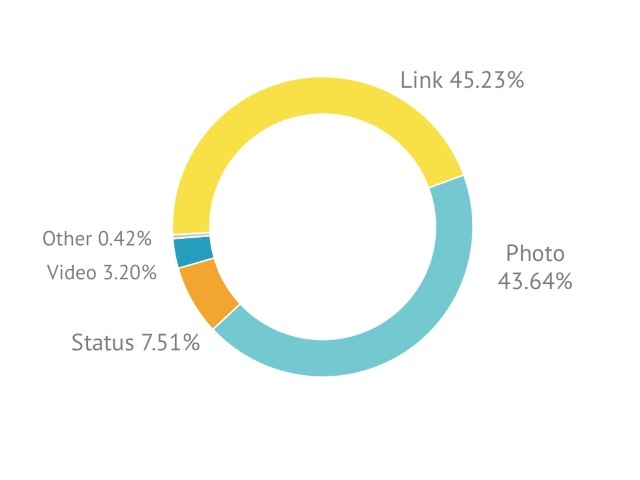 Social media analytics provider Quintly studied some 100,000 pages and more than 8 million posts between June 2014 and June 2015, finding that posts containing links accounted for 45.23 percent of total volume, edging photo posts, at 43.64 percent. Posts containing videos and text-only status updates were barely factors, according to the Quintly study. However, in terms of interactions, video posts performed the strongest, followed by photos. Interestingly, videos were posted rarely, but going one step deeper into the analysis, we found out that “moving pictures” are driving the highest interaction on Facebook. Videos, the highest engagement driver, are followed by image posts, which performed second best–with an increasing trend throughout the year. Due to the strong rise of video posts during the last year, interactions per post went down during the analyzed period–vice versa for photo posts. Here the post frequency for the average Facebook page decreased from 29 to 27 per month but the average interactions increased from 2,000 to 2,500-plus for each post. As Timelines are getting more crowded every day, it is essential to choose the correct post type to unlock the potential your posts have. The stats we analyzed underline the relevance of attention-grabbing images in social media strategies once again. Readers: What did you think of the latest findings by Quintly?